Anyone who knows me knows that I love video games. And I'm pretty damn good at them. As a nerdy kid I became ridiculously good at Pac Man (without learning a pattern from a book, I made up my own), and from there it just went downhill. There's hardly a video game I didn't waste countless hours (and quarters) mastering. Then, of course, console and computer video games came along. Goodbye teenage social life. It took me years to recover from that. Luckily, I more or less gave up video games in college, when beer and girls suddenly became more interesting than Ultima III. With the exception of a brief stint that began with the dawn of the first person shooter (I mean, c'mon, Doom was like nothing I'd ever seen before, how could I not get hooked on that?) and finally ended with many 4 AM session of Unreal Tournament, I cut myself off. Call it a self-intervention. I deleted all that crap from my computer and didn't play video games any more. Until now. I got a new roommate a few weeks ago who brought an Xbox 360 into my house. Seemed innocent enough. I'm over that, I can handle it. I'm probably the last person on earth to have gotten hooked into this craze, but it hooked me hard. 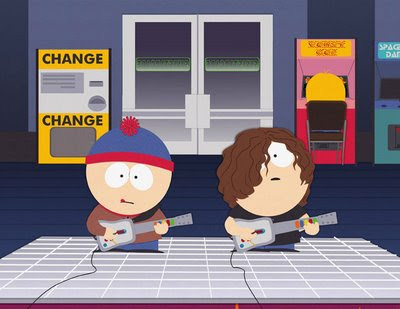 I mean, it combines all my favorite things - rocking out, playing guitar (sort of), and video games. It's air guitar with a scoreboard. And believe it or not I actually believe that the finger dexterity it develops will help me when playing ACTUAL guitar (which I swear will happen again. Once I can get through Knights of Cedonia on Hard). So anyway. I am telling you all this so you know why I haven't posted much lately. It's because I'm completely sleep deprived from staying up until all hours playing Guitar Hero, instead of thinking of things to blog about. I believe I've taken the first step towards recovery. I'm aware that I have a problem. I also have a pulled muscle in my right arm from playing Dragon Force's "Through the Fire and Flames" on Medium last night. Badly, I might add. How the hell does anyone play this on Hard, much less Expert? There I go again. I am going to try to care about something other than this game. To that end I decided to finally take the plunge and get a digital SLR camera. I decided on the Nikon D60, it is now officially on order and I should have it in a day or two. If it takes an expensive new toy to get me away from the life-sucking Xbox then so be it. I like that the tag for staying up playing video games is, "partying." Hey, give me Grand Theft Auto after a bad day and I'm a happy girl. I physically can't stop playing COD 4. Its killing me slowly. Is your DCist icon a Pink Floyd reference? If so, you rock. In college I became insanely addicted to Snood. The most inane game EVER. I still see snoods in my sleep. Not only do I understand your addiction, I share it. One of my best friends has Guitar Hero and I have gone over to his house repeatedly under the guise of visiting. But we all know I'm just there to play GH. I'm afraid if I actually get it for my own home, I'll end up like you. I'm excited to hear about your new toy! You'll have to let me know how you like it when it comes in! It has arrived! I am very excited. I am also somewhat out of my league. As in, I not only need to read the instruction manual (shudder) I think I need to take a class. I've played a little bit. It's pretty damn cool... but this is the real deal, I'm not in Kansas anymore.